Indulge in the rich and classic look of this excellent accent pillow from designer Luli Sanchez. Brimming with plush poly fill that's incredibly soft and uniquely supportive, this handsome pillow incorporates knife edging and a removable linen cover that's machine washable. 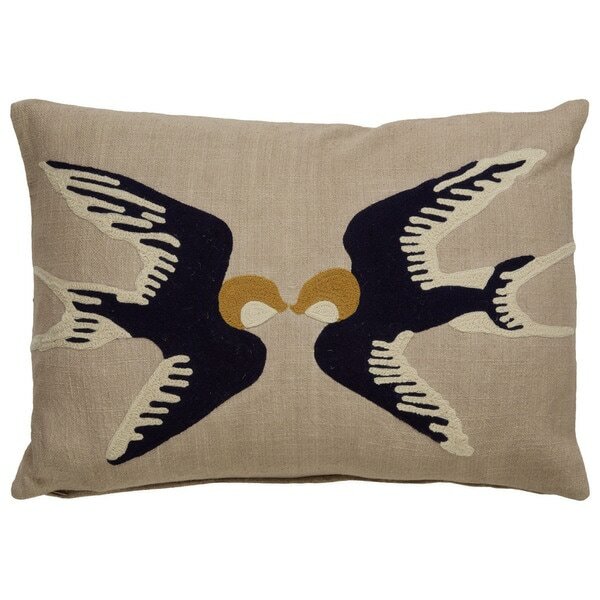 The charming design features a pair of abstract navy birds against a beige background. Awesome tribal pattern and plush filler. Love the linen look of these pillows. They have a zippered removable cover so can easily be taken off and put through wash. I have allergies so it's important to me. Great quality pillow, used on the bed. Very pretty tan, black, and gold colors. It really gives the bed a finished look and I really like the love birds. Love it...looks great on my white linen duvet cover with my Pendleton blanket accessories. In person, not quite as nice as I was expecting. I probably wouldn’t have ordered if I’d seen it in person. But will keep anyway. "What are the colors of this pillow - It states blue and tan in specs, and also states black and tan in details."